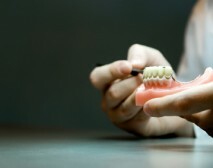 Handling a denture requires care. It’s a good idea to stand over a folded towel or a sink of water just in case you accidentally drop the denture. Brush the denture each day to remove food deposits and plaque. Brushing your denture helps prevent the appliance from becoming permanently stained. It’s best to use a brush that is designed for cleaning dentures. A denture brush has bristles that are arranged to fit the shape of the denture. A regular, soft-bristled toothbrush is also acceptable. Avoid using a brush with hard bristles, which can damage the denture. Over time, adjusting the denture may be necessary. As you age, your mouth naturally changes, which can affect the fit of the denture. Your bone and gum ridges can recede or shrink, resulting in a loose-fitting denture. Dentures that do not fit properly should be adjusted by your dentist. Loose dentures can cause various problems, including sores or infections. See your dentist promptly if your denture becomes loose. Brushing twice a day and cleaning between your teeth daily help prevent tooth decay and periodontal (gum) disease that can lead to tooth loss. Pay special attention to cleaning teeth that fit under the denture’s metal clasps. Plaque that becomes trapped under the clasps will increase the risk of tooth decay. Your dentist or dental hygienist can demonstrate how to properly brush and clean between teeth. Selecting a balanced diet for proper nutrition is also important.